In you, the orphan finds mercy. Six years ago, my husband Jim and I walked into an orphanage in Czestochowa, Poland with a blanket, diapers and open arms to bring our daughter home. Our lives were never the same. If you don’t know our adoption story, you can read more about it, here. You can also watch our story on EWTN, here. As we approach the anniversary of our “Gotcha Day” as well as her birthday, we want to do something special. 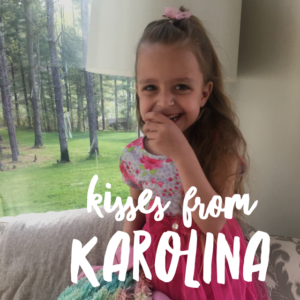 In honor of Karolina, we are kicking off a special initiative. Karolina spent the first eleven months of her life in an orphanage surrounded by other children who also needed a home and a loving family. Our daughter is thriving today because of the miracle of adoption. When we picked her up that Sunday in 2011, we were given a small brown paper bag with her belongings inside: two baby bottles, a crib blanket, a pillow, and a few sleepers. These were the only earthly things she had accumulated in her eleven months of life. It was a sad reality. But it was also a powerful witness to what matters most. Life. Love. Family. Home. As we scooped up our precious girl, we left behind an entire orphanage full of precious kiddos with their arms outstretched waiting for a family. Yes, there are orphans who need a home in our own country. In every city in the world there are children in need of a loving home. But God led us to Poland. He showed us the faces and presented the need. We cannot ignore it. These are Karolina’s compatriots. Her orphan family. It is for these children that we advocate for and ask your help. It is our prayer that with your generous gift, we can help send “kisses” to these kiddos by uniting at least one of these precious children with parents and a forever home. All proceeds will go to a family in the adoption process at the same agency that helped make our dream come true. Click the link, here to read more. Please consider spreading the word and sharing. As we approach Pentecost, we celebrate the power of the Holy Spirit to open eyes, ears, and hearts! Thank you for taking the time to read. God bless you!